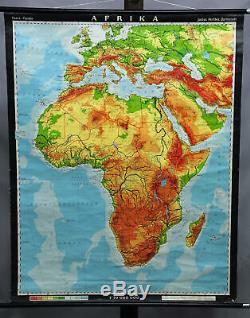 Africa vintage decoration item rollable school map wall chart poster print. Item: r1191 a classical pull-down wall chart showing a map of Africa. Used as teaching material in German schools. Colorful print on paper reinforced with canvas. Published by Justus Perthes Darmstadt. Height: 47,24' inches width: 37,99' inches. All offered wall charts are in a good original condition. They have been utilised and therefore show age-related traces of usage. Some wall charts have been laminated partly with glue stripes. During storage the wall charts are partly fissured, stained and some sometimes smell. The wall chart´s crossbar (either metal or wooden) could be damaged or dented. Further visible defects like e. Water spots, hand-written marking etc. Are separately mentioned in the article description (see also the picture). The item "Africa vintage decoration item rollable school map wall chart poster print" is in sale since Wednesday, March 20, 2019. This item is in the category "Antiques\Maps, Atlases & Globes\Africa Maps". The seller is "artfour" and is located in Berghülen. This item can be shipped to North, South, or Latin America, all countries in Europe, all countries in continental Asia, Australia.